We began this school year with 45 new iPads for use in the classroom and by the end of the year we had almost 60. Being one of the first schools in our district to have school iPads, we quickly found ourselves in need of creating our own policies and forms for iPad checkout. Below are some of the forms that worked for us. 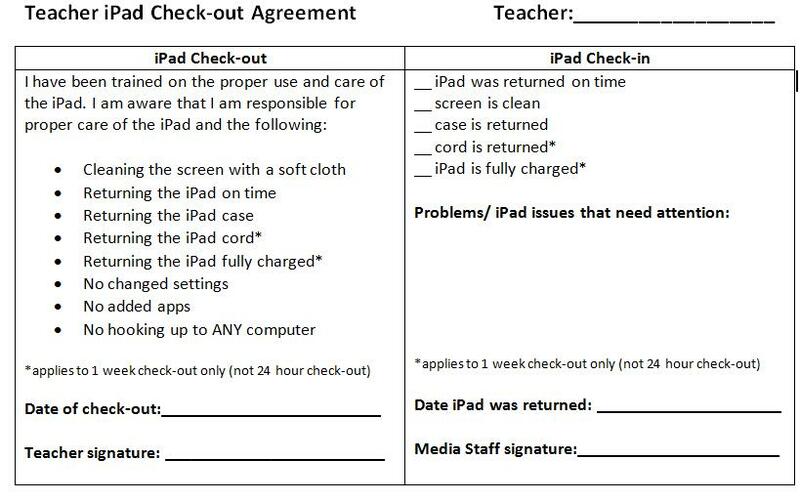 Maintenance: We found it helpful to keep the following chart on a clipboard attached to each iPad cart to help keep up with maintenance issues or noticed damage to the iPads. This way teachers could write down issues as they noticed them and we could be sure they were attended to as soon as possible. 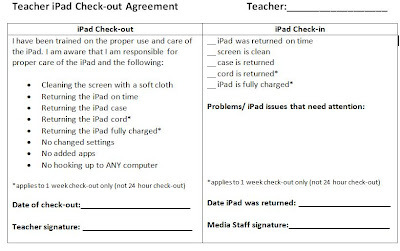 Teacher checkout agreement: At our school, we posted the iPad reservation schedule for teachers to access online. This allowed teachers flexibility to reserve six iPads for a small group activity or an entire cart / class set of iPads as needed. As teachers came to the media center to check out the iPads they reserved, we used the following form to help us have a visual of where the iPads were for the day. How did you create an online reservation schedule for your iPad cart sign out? Where can I get these forms to print? ?